Last year, The Economist wrote that “data is the new oil.” And in the government, this perspective is increasingly reflected in its priorities. For example, the current Administration has made the development and implementation of a Federal Data Strategy a key element in its management reform efforts in coming years. It is a key element for good reasons. Data is the crucial underpinning of performance measurement, program evaluation, artificial intelligence, predictive analytics, and more. While the federal government has set open data policies and created greater access to government data, it lags behind the private sector and state and local governments when it comes to having a governance framework and leadership on the issue. Legislation, however, is pending that could jumpstart for data-driven agencies at the federal level by creating a stronger focus on data. A bill would require that all agencies designate a Chief Data Officer (CDO). But what is the value of having a CDO in making agencies more data-driven? What do CDOs do to help improve agency data and analytics capacity? A new IBM Center report by Harvard Kennedy School’s Jane Wiseman describes the work of pioneering CDOs in selected federal agencies, discusses their roles and responsibilities, and outlines the competencies needed to be a successful CDO who can help agencies make better use of data at all levels of government. Status of CDOs Currently in the Federal Government. Given its size and the amount of data it collects and stores, there are relatively few data leaders in the federal government. Only 6 of the 24 departments and major agencies have top-level CDOs. At the bureau level they tend to be in the scientific and statistical agencies, like EPA and the Bureau of Labor Statistics. 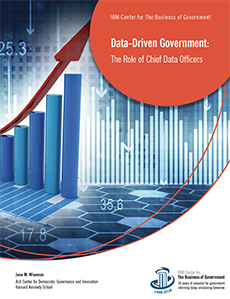 Most the largest federal agencies lack enterprise-wide data leadership. This means that CDOs are far less common in the federal than in state and local government. While few in number, those federal CDOs who are in place, according to Wiseman, “excel at levels to be admired across both the public and private sectors.” For example, she points to successes such as the development of predictive analytics models to root out fraud. She found that many current federal CDOs have been in their positions for several years, far surpassing the average tenure of CDOs in city and state government, and that they have assembled highly capable teams to deliver important results for their agencies. In one case, she documents a return on investment of $5 for every $1 in staff cost. What Does a CDO Actually Do? The role of a CDO often seems opaque to outsiders, but Wiseman develops a series of personal profiles of trailblazing CDOs. For example, Brandon Pustejovsky developed the role of CDO in the U.S. Agency for International Development (USAID). He was appointed to be its first CDO in 2014 and reports to the CIO. Pustejovsky was not born a “data geek.” His background is development policy and management and has an MA in International Relations. He has developed a team of 40 specialists and is responsible for enterprise data analytics and reporting, open data, data governance, and data literacy within USAID. Develop competence in the organization’s basic data infrastructure: At a minimum, a CDO must competently manage the basic data infrastructure of the organization, supporting open data and data visualization platforms and maintaining the data warehouses and tools needed for the organization. These operational “nuts and bolts” form the core of what a CDO must do well. Display openness to innovative ideas and approaches: A great leader is open to pushing his or her organization forward, to innovation, to new ways of thinking, and to new methods and tools. Each of the CDOs profiled here has nudged his or her organization along the journey toward data-driven government while keeping an open mind and being able to adapt to changing opportunities. Demonstrate the capability to deliver on promises: While openness to innovation makes for a visionary leader, the vision can only be realized with consistent attention to delivery. This is an often-overlooked but critically important element to success. New CDOs should let strategy drive operations and should focus on delivering value for their customers. An agency’s business challenges should drive a CDO’s work, and CDO teams should solve the most important public problems, as expressed by the managers and executives in their agency. Each CDO should create a team with diverse and complementary skills A CDO should bring together specialists across disciplines such as business process analysis, data science, data management, and data visualization. In hiring, CDOs should not underestimate the importance of people skills, and should use creative hiring strategies. CDOs need to deliver on analyticsetting the basics right and providing data stewardship. A CDO needs to solve the problems that matter most to their organization’s customers, deliver timely and useful results in a customer-friendly format, and leverage existing tools and resources.